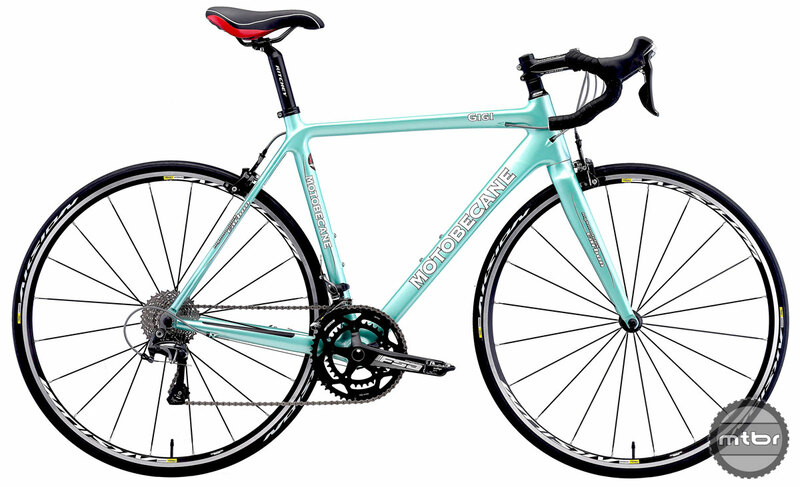 Motobecane USA is not at the Interbike show this year, so here is their ‘virtual’ booth for your viewing pleasure. 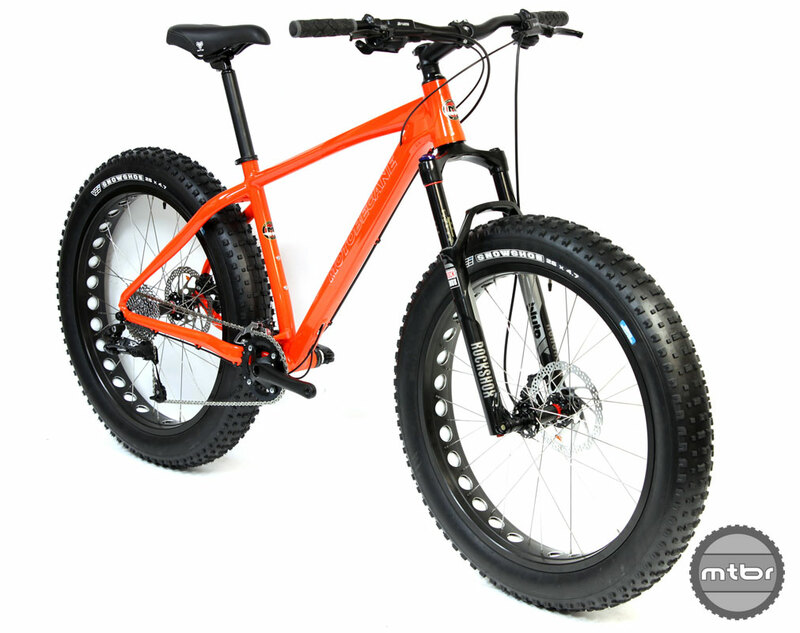 We are dominating the Fat Bike market with more models than any other brands. 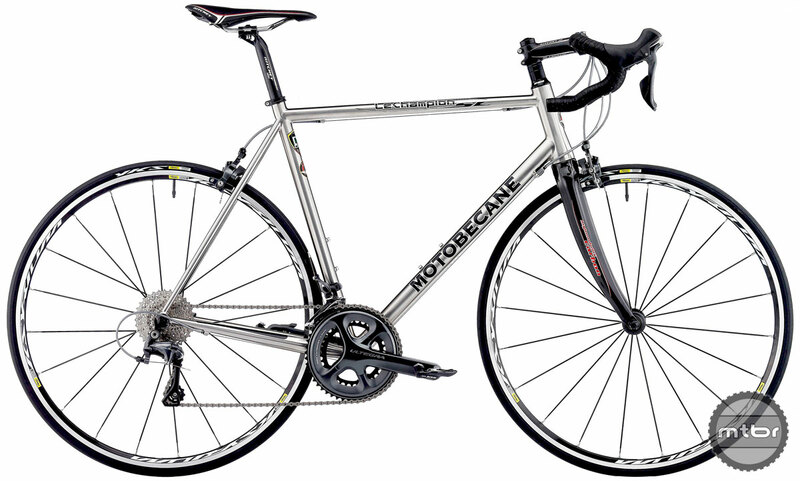 Motobecane USA is the only brand that has models made of nearly every material available. High Grade steel, Titanium, Aluminum and Carbon. 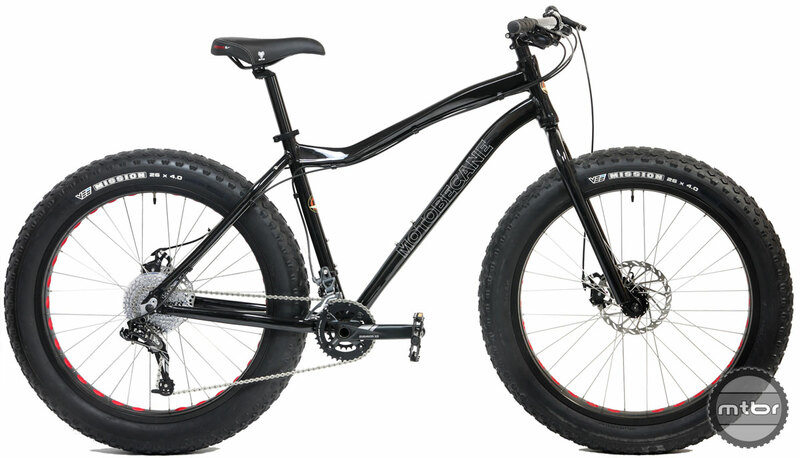 Amazing handling Fat Bikes, 29ers to 27.5 Titanium models. 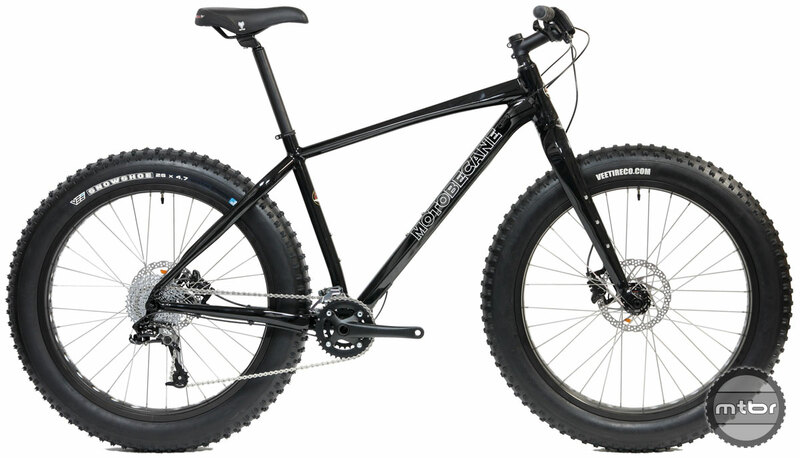 Advanced Full suspension with up to 6 inches of terrain eating travel. Frame: Motobecane Hydroformed Aluminum Alloy 6061 Frame w/Disc Mount, TIG Weld, replaceable rear derailleur hanger, H2O bosses, Tapered Head Tube: ALLOY 1-1/8" / 1.5" (50x44/62x55.95mm), L: 39/45/48/53CM = 110/120/135/150mm, B.B. Shell: Alloy 100mm, Alloy (34.9xt2.25mm) w/FD Bracket,. For 30.9 S/Post, 190mm Thru-Axle Rear. Internal Downtube cable routings. Specs subject to change to meet production logistics or manufacturer upgrades. Super wide tires “float” over snow and sand. The fastest bikes you’ll ever ride on mud, bogs, deep sand and snow. As a bonus, they’re great convo makers and super smile-generators. 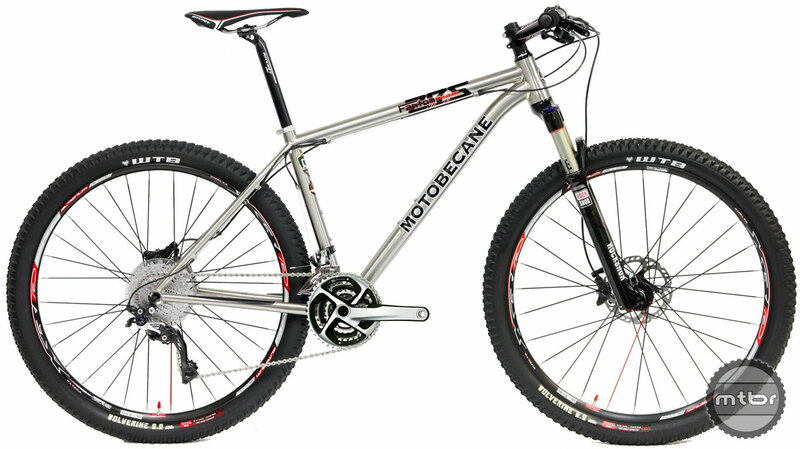 Frame: Motobecane Hydroformed Aluminum Alloy 6061 Frame, w/Disc Mount, TIG Weld, replaceable rear derailleur hanger, H2O bosses, Tapered Head Tube: Alloy 1-1/8" / 1.5" (50x44/62x55.95mm), L: 39/45/48/53CM = 110/120/135/150mm, B.B. Shell: Alloy 100mm, Alloy (34.9xt2.25mm) w/FD Bracket,. for 30.9 S/Post, 190mm Thru-Axle Rear. Internal Downtube cable routings. 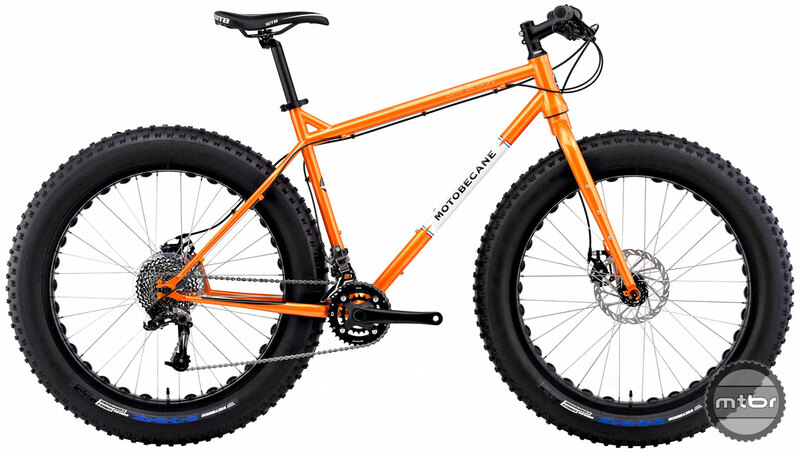 Same Top-of-the-line Hydroformed Aluminum frame as the NightTrain Fatbikes. Frame: Motobecane Hydroformed Aluminum Alloy 6061 Frame, w/Disc Mount, TIG Weld, replaceable rear derailleur hanger, H2O bosses, Tapered Head Tube: Alloy 1-1/8" / 1.5" (50x44/62x55.95mm), L: 39/45/48/53CM = 110/120/135/150mm, B.B. 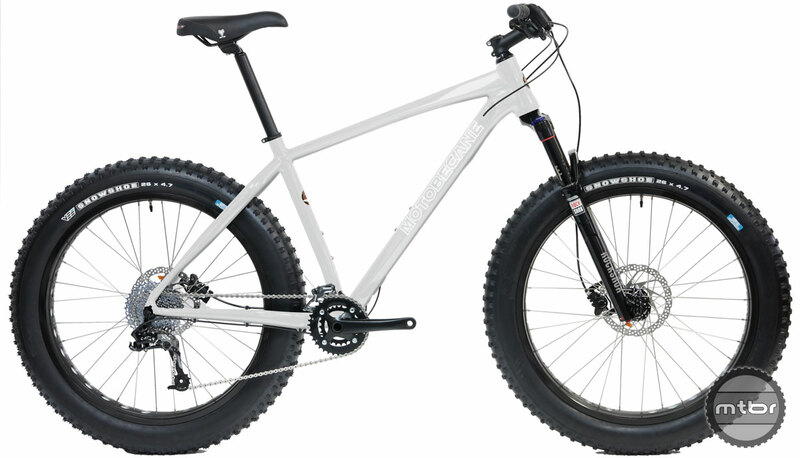 Shell: Alloy 100mm, Alloy (34.9xt2.25mm) W/FD Bracket, For 30.9 S/Post, 190mm Thru-Axle Rear. Internal Downtube cable routings. 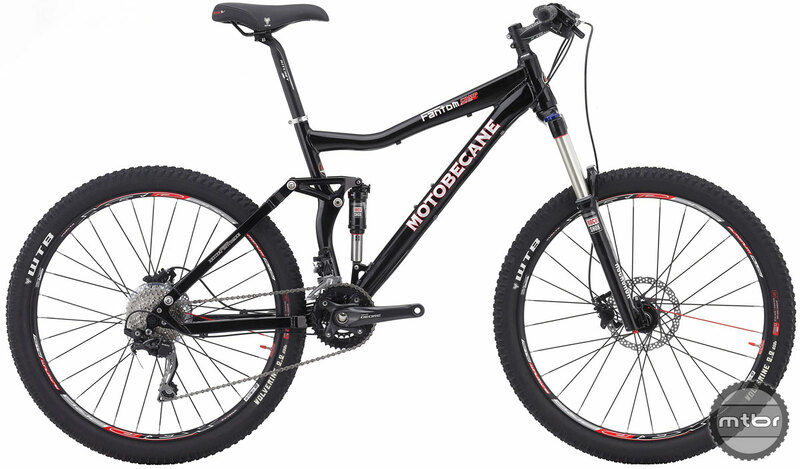 Frame Motobecane Hydroformed Aluminum Alloy 6061 Frame, w/Disc Mount, TIG Weld, replaceable rear derailleur hanger, H2O bosses, Tapered Head Tube: Alloy 1-1/8" / 1.5" (50x44/62x55.95mm), L: 39/45/48/53CM = 110/120/135/150mm, B.B. ShellL: Alloy 100mm, Alloy (34.9xt2.25mm) w/FD Bracket,. 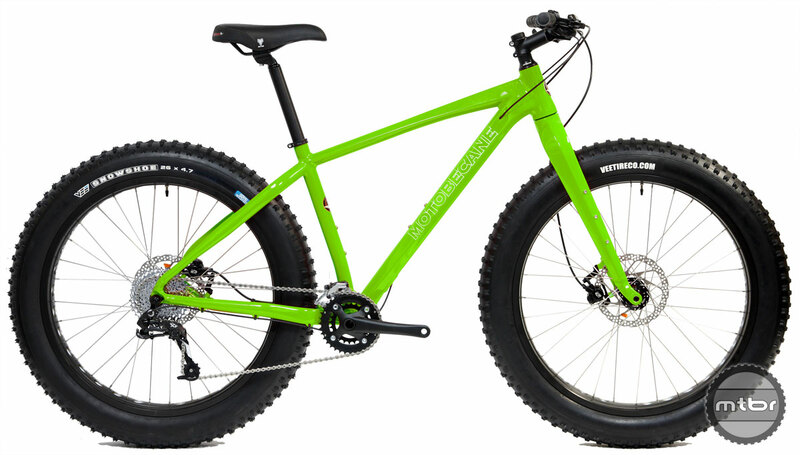 For 30.9 S/Post, 190mm Thru-Axle Rear. Internal Downtube cable routings. 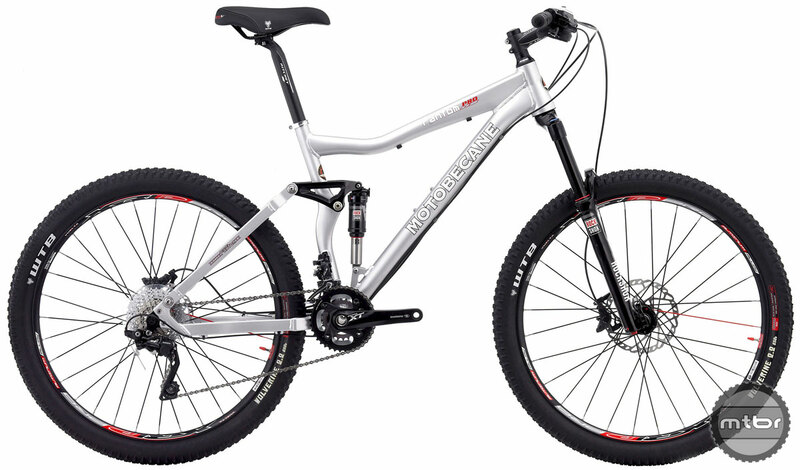 Advanced Hydroformed Aluminum with lowered top tubes for trail-ready performance. Stem: ( C:31.8mm ) Alloy 6061 Threadless A-Head Stem.EXT:(7°)80/90/100/110/120MM FOR 36/41/46/51/56CM ,C/S:31.8x28.6x41mm. This Titanium 27.5 / 650B is equipped with the top-shelf, ten-speed, hollow aluminum Shimano Deore XTR crank. Includes a super fast rolling, Sealed External BB System. Check out the FSA cartridge headset, sweet shifting 2015 Shimano 3 x 10 speed drivetrain with even lighter, precision bearing Vuelta XRP 27.5 / 650B edition SL Disc hubs and the hot new Shimano Deore XT Hydraulic Disc braking system. This bike has world dominating parts, without any doubt. Imagine the trails you will crush with 150mm up front and up to 6 inches of travel in the rear. No corners are cut, the FANTOM 6BY6 FS has top-of-the-line Full Race specs. A 150mm Rockshox Revelation RCT3 27.5/650B fork with up to SIX inches of travel in the rear, the NEWEST Rockshox MONARCH Air rear shock with Rapid Recovery Rebound Technology. Imagine the trails you will crush with 150mm up front and up to 6 inches of travel in the rear. No corners are cut, the FANTOM 6BY6 FS has top-of-the-line Full Race specs. A 150mm Rockshox Sektor 27.5/650B fork with up to SIX inches of travel in the rear, the NEWEST Rockshox MONARCH Air rear shock with Rapid Recovery Rebound Technology. The NEW Le Champion CF Team - You will be smiling in comfort as you drop other riders on hills and headwinds with the extra lower gears you have on your 22 Speed Shimano Dura Ace full carbon aero road bike. The beautiful carbon fiber frame is made with great care from high modulus carbon fiber. Fully engineered for a resilient ride and even more comfort comes from the Kinesis Carbon Fiber fork with advanced Tapered Steerers for precision handling. Power-Tapered Titanium head tubes and Tapered Steerer Carbon Fiber forks for surgically precise handling with plush vibration dampening High Modulus 3K Carbon legs. 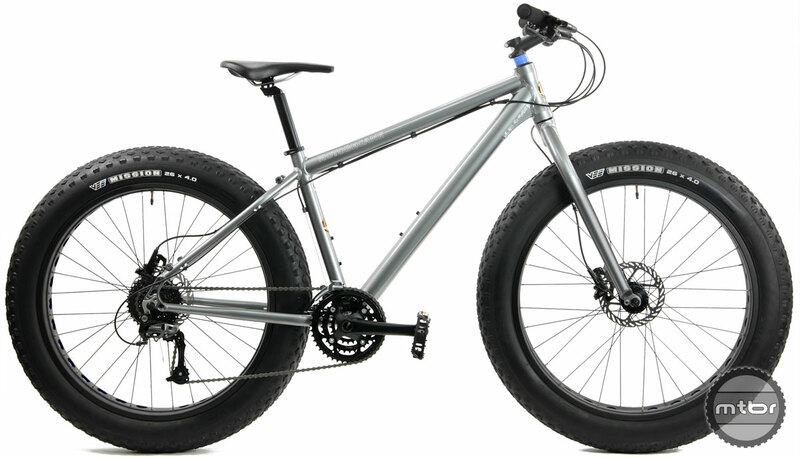 Features: Geometrically enhanced, butted 3/2.5 Titanium tubing. Engineered for optimum ride quality and power transference. The Gigi TEAM is top of the womens line and one of the best carbon women specific bicycles we have ever seen Every detail designed by Motobecane's women's cycling team to meet the special needs of ladies. Every Gigi TEAM is hand-built from specially shaped carbon with Motobecane's legendary quality and attention to detail. 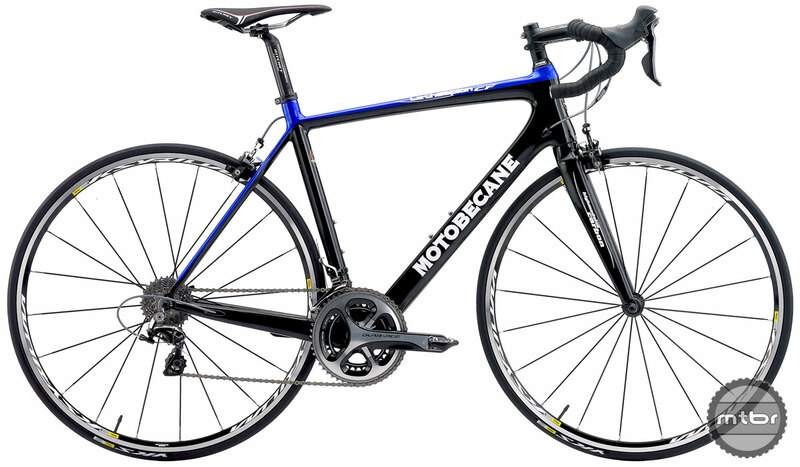 Equipped with advanced carbon frame and fork, this is the ultimate women-specific bike from Motobecane rides extra smoothly. You will be smiling in comfort as you drop other riders on hills and headwinds with the extra lower gears you have on your Shimano Ultegra, full carbon road bike. The beautiful carbon fiber frame is made with great care. Fully engineered for a resilient ride and even more comfort comes from the Kinesis Carbon Fiber fork and advanced Tapered Steerer for precision handling. Cyclocross is Sunday morning bike-race madness. It's all the fun you can stand. Lap after lap around a dirt course you can't entirely ride; You've got to run some of it with your bike on your shoulder. That is what makes the SRAM Rival equipped Fantom Cross Pro such a versatile bike - it has to be fast, durable, light and capable in nearly all conditions and THAT makes it the perfect bike for everyday, fast, durable riding in most any condition. 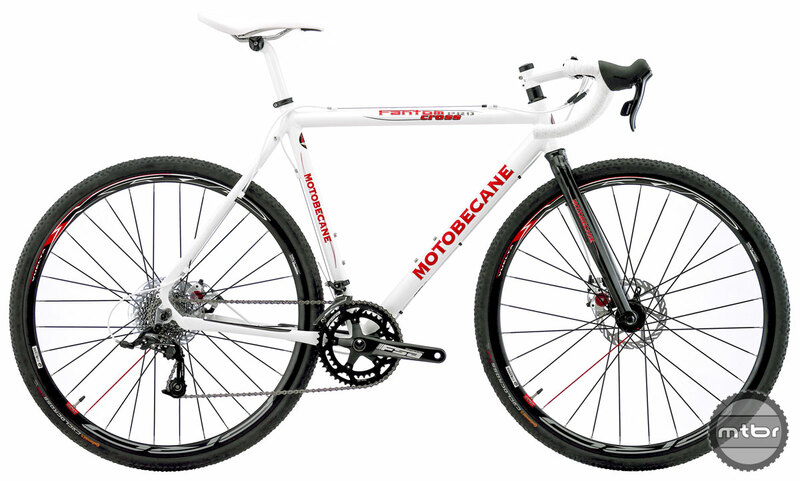 The 20 speed SRAM Rival equipped Fantom Cross Pro is the ULTIMATE all purpose Motobecane bike for 2014. The frame is the NEWEST Butted Aluminum alloy with Butted down tube, Integrated HeadTube, water bottle mounts. Cyclocross is Sunday morning bike-race madness. It's all the fun you can stand. Lap after lap around a dirt course you can't entirely ride; You've got to run some of it with your bike on your shoulder. That is what makes the Fantom Cross PRO Titanium such a versatile bike - it has to be fast, durable, light and capable in nearly all conditions and THAT makes it the perfect bike for everyday, fast, durable riding in most any condition. The 22 Speed SRAM Rival equipped Fantom Cross PRO Titanium is the ULTIMATE all purpose Motobecane bike for 2015. 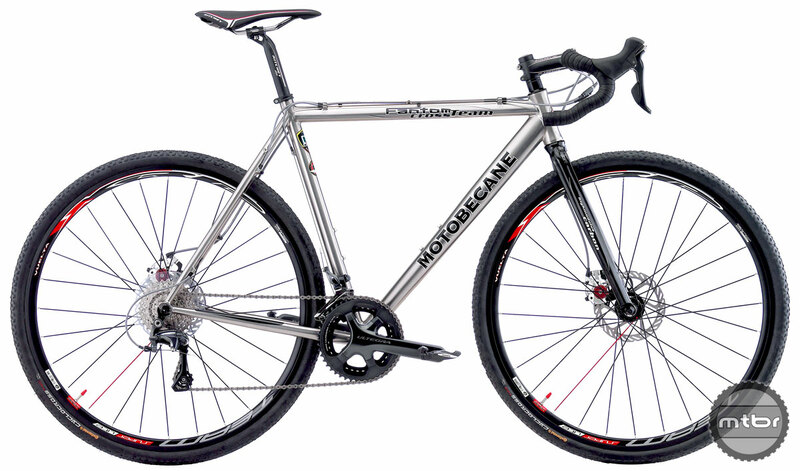 The frame is Geometrically enhanced 3/2.5 Titanium with Vari-butted tubing, Integrated Head Tube, Double water bottle mounts, frame is Disc Brake Compatible. Cyclocross is Sunday morning bike-race madness. It's all the fun you can stand. Lap after lap around a dirt course you can't entirely ride; You've got to run some of it with your bike on your shoulder. That is what makes the Fantom Cross Team Titanium such a versatile bike - it has to be fast, durable, light and capable in nearly all conditions and THAT makes it the perfect bike for everyday, fast, durable riding in most any condition. The 22 Speed Shimano Ultegra equipped Fantom Cross Team Titanium is the ULTIMATE all purpose Motobecane bike for 2015 the newest Ultegra 6800 Shifters+Derailleurs) The frame is Geometrically enhanced 3/2.5 Titanium with Vari-butted tubing, Integrated Head Tube, Double water bottle mounts, frame is Disc Brake Compatible.